February's seasonally adjusted annual sales rate of 16.24 million was lower than estimates as recent as late last week, when analysts said record cold and snow in many states had done little to keep consumers away from showrooms. Toyota and Subaru joined a handful of smaller automakers in posting double-digit U.S. sales increases for February as severe winter weather crimped demand more than analysts had forecast. Most companies posted modest gains as the overall industry rose 5.3 percent. While last month’s pace trailed January’s hot start, the industry has taken solid early strides towards its sixth year of sales advances since the recession. The seasonally adjusted annual sales rate of 16.24 million was lower than estimates as recent as late last week, when analysts said record cold and snow in many states had done little to keep consumers away from showrooms. “I don’t think there’s any question things were slow a little bit in the last week,” said Mark LaNeve, Ford’s vice president of U.S. marketing, sales and service. Among companies with more than a point of U.S. market share, Subaru led the way with a 19 percent gain. February marked the first time since June that Subaru failed to advance at least 20 percent. BMW Group climbed 18 percent, as its namesake brand outsold Mercedes-Benz (excluding Sprinter) in a seesaw luxury sales race. Toyota Motor Sales tallied a 13 percent rise in outselling Ford Motor Co. for the first time in six months. Overall sales came in at 1.26 million. The average of nine analysts surveyed by Bloomberg had pointed to an increase of 8 percent, for a total of 1.3 million. Likewise, the 16.24 million SAAR -- the lowest since April -- was below analysts' consensus of 16.6 million. Across the industry, light-truck sales -- an ongoing bright spot for many automakers -- advanced 12 percent last month while car deliveries slipped 1.4 percent. Rising gasoline prices and record cold and snow in many states did little to curb demand, analysts had said before today. Meanwhile, low interest rates, wide availability of long loans and aggressive lease offers continued to pull customers in. Toyota reported sales of 180,467 Toyota, Scion and Lexus vehicles, with light trucks setting a February record. The advance was spurred by a 22 percent increase at Lexus, which set a February record in recording its third straight double-digit gain. Sales at the Toyota brand rose 13 percent. Toyota’s top-selling cars, the Corolla and Camry, were up 10 percent and 14 percent, respectively. On the truck side, the RAV4 climbed 33 percent. Fiat Chrysler extended its streak of year-over-year gains to 59 consecutive months with a 5.6 percent increase. 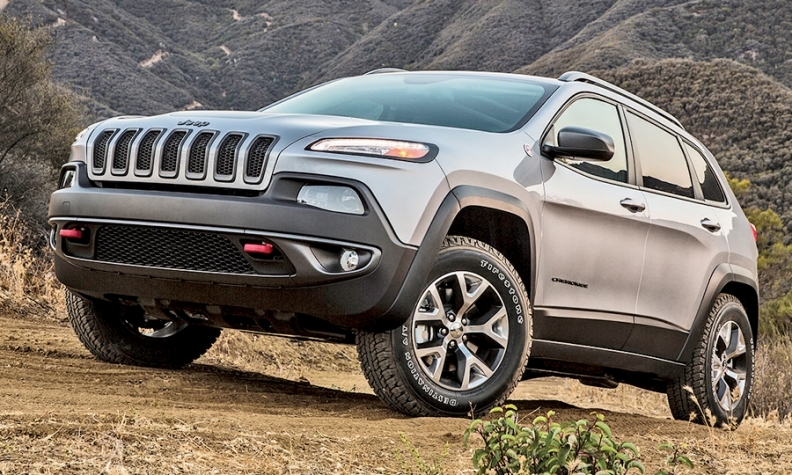 Jeep continued to set the pace for FCA, with a 21 percent gain. The Ram brand jumped 12 percent, while sales rose 13 percent for the Chrysler brand. Dodge sales fell 15 percent, and Fiat was down 5.1 percent. Sharply higher truck deliveries led General Motors to a 4.2 percent February gain. Combined sales of pickups, SUVs and vans jumped 36 percent from a year earlier, while demand for GM’s highest-volume cars plunged. The Chevrolet Cruze, for example, was down 16 percent, and Sonic deliveries plunged 62 percent. Truck brand GMC led the way for GM with a 19 percent gain, its fourth-straight monthly double-digit increase. Chevrolet rose 3.8 percent. Cadillac sales dropped 13 percent and Buick sales fell 9.2 percent amid weak demand across its car lineup. 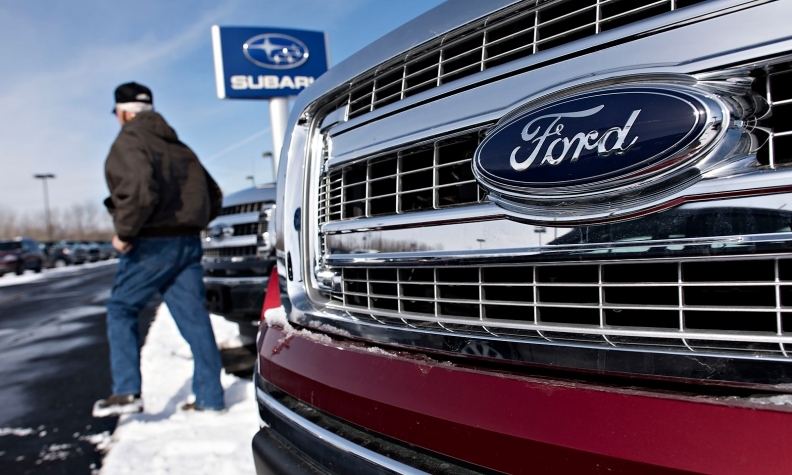 Ford Motor sales fell 2 percent. The namesake brand dropped 1.8 percent, its fourth decline in the last six months. Lincoln ended a streak of five straight double-digit gains, falling 7.5 percent. The Jeep Cherokee posted record February sales. †Fiat S.p.A. completed the acquisition of Chrysler Group LLC on Jan. 21, 2014; the companies were merged under holding group Fiat Chrysler Automobiles on Oct. 12, 2014. The automaker said it remains hampered by tight inventories of the aluminum-bodied 2015 F-150, which began shipping to dealers in November. Bright spots included the Explorer and Mustang, with both nameplates increasing 32 percent. At Nissan North America, the Infiniti luxury brand surged 20 percent, while the Nissan Division gained 1.1 percent. American Honda extended its monthly winning streak to seven with a 5 percent lift. As with its biggest Japanese rivals, Honda’s luxury unit outpaced the mainstream brand. Acura sales rose 13 percent, helped in large part by the new TLX. A 12 percent drop for the Accord limited Honda Division’s increase to 4.1 percent. Hyundai rose 7.1 percent, helped by the Genesis, Sonata and Santa Fe. Sibling Kia kept a short winning streak alive with a 6.8 percent increase. Volkswagen Group deliveries fell 2 percent, ending a four-month run on the plus side. The VW brand lost momentum, too, down 5.2 percent. The Golf family of compact cars was the only VW nameplate to see sales rise last month, as volume more than doubled to 3,921 units. Mazda's 5.4 percent gain marked its 11th increase in the past 12 months. Much smaller rival Mitsubishi was up 26 percent, while Jaguar Land Rover climbed 14 percent. FCA’s incentive spending decreased 3.2 percent year-over-year, roughly in line with the overall industry’s decline of 2.9 percent, according to TrueCar. GM, Ford Motor and Nissan North America each cut incentives by more than that. The only major automaker to significantly boost discounts was Hyundai-Kia Automotive. TrueCar said incentives jumped 10 percent for the Hyundai brand and 35 percent, to $3,000 per vehicle, for Kia. West Herr Kia in Orchard Park, N.Y., was advertising three-year leases on the 2015 Forte sedan for as low as $89 a month and a 2014 Cadenza at $9,000 off the sticker price of $35,975. Industrywide, incentives averaged $2,623 per vehicle, 1.4 percent higher than January, when sales rose 14 percent. Overall, though, analysts say demand is being driven by the strengthening economy, not artificially by incentives. Among major automakers, GM and Toyota have gained U.S. market share this year through February, while Ford, Nissan, Honda and Hyundai-Kia have lost ground. FCA's share remains flat at 12.9 percent. Consumer confidence hit an 11-year high in January before declining slightly in February. Government statistics show that the U.S. economy added jobs from November through January at the fastest rate since the 1990s. A metric calculated by Morgan Stanley as a predictor of auto sales climbed to the highest level in more than a decade last month. “Ideal credit conditions allow consumers to upgrade to bigger, more expensive vehicles,” Morgan Stanley analyst Adam Jonas wrote in a report last week. U.S. gasoline prices, after falling for a record 123 consecutive days, turned higher in late January and climbed for 35 consecutive days, AAA said Monday. They remain well below the $4-a-gallon level that drivers had been experiencing, though. In a research note today, Wells Fargo analyst Richard Kwas stressed that sales delayed by bad weather in February would be shifted to this month. Larry Vellequette, Mike Colias and Ryan Beene contributed to this report. AutoNation's 8% sales gain beats market for Feb.